Apple AirPods are slowly taking over the ears of the developed world, with more people each day picking up the earbuds and going wireless. But while the lure of Apple's earphones is their ability to keep things simple and work seamlessly with your Apple Watch, iPhone or Mac, there's still some questions you may have when first setting up or learning how to use them. Thankfully, that's where we come in. You've probably already realized the AirPods can perform neat tricks like pause when you take one out or work with Siri, but what else can these smart earbuds do - and what can't they? Read on below for all the answers, as we look to clear up any confusion with our string of FAQs and tips. How do Apple AirPods charge? There are no obvious charging ports or anything like that for the AirPods. They just look like regular EarPods with the cables snipped off. The way it works is like this: on the end of the "stalk" of the AirPods, there's a little silver ring with two slits in it. When you insert the AirPods into the charging case, those slits align with charging nodes at the bottom of the case. That's how they charge. And, of course, to charge up the AirPod case you simply plug it into a Lightning cable. However, through the second generation, that has changed a bit, too, with a new Wireless Charging Case letting you, well, charge wirelessly. How long do AirPods last? Apple indicates that AirPods can give you around five hours of listening time or two hours of talk time on a single charge. With multiple charges in your case, you get more than 24 hours of listening time, or up to 11 hours of talk time. Can Apple AirPods charge wirelessly? Yes. With the second-generation AirPods, users now have the option to buy a Qi-compatible wireless charging case - either with the new AirPods or separately. It joins the latest iPhone models to offer the feature, meaning you can place it on a Qi charging mat and watch the juice restore. With AirPower now officially canned, you'll have to explore third-party mats. Or, alternatively, if you have the first-gen case and don't want to pay for the upgrade, there are cases for your AirPods that are Qi-compatible. How do you clean Apple AirPods? If you wear your AirPods regularly, it should be a basic hygienic step to give your AirPods a scrub from time to time. In order to clean your AirPods, make sure you use a soft, dry and lint-free cloth and use a cotton swab to get inside the microphone and speaker mesh. We shouldn't have to tell you, but don't try and ease things along with any sharp objects or liquid - or water, obviously. How do I connect AirPods to Mac? Whether you've got a MacBook Pro, MacBook Air or just a regular Mac, the process for connecting AirPods is the same. And if you've already set up the earbuds with your iPhone and your Mac device is signed in to iCloud with the same Apple ID, they're probably already able to pair. To check, click the Apple logo > System Preferences > Bluetooth and hit 'Connect' if you see a device named AirPods. The process is much the same for connecting your AirPods to a PC or Android device, but read our full guide for all the steps and troubleshooting tips. How do you find lost Apple AirPods? AirPods are easy to lose - they're small, and if you drop them they could easily bounce under a bed or, worse, somewhere you can't get them back from. So, what do you do if the unthinkable happens? If you do drop them, or fall asleep with them on and they fall off into a nook or cranny, you can use the Find my iPhone app to locate them. Once you're near, you can also make them emit a sound to help you locate where they are. If you've used an Apple device in the past five years, you know that the big thing the company pushes you to sign up for is an Apple ID. This allows you to download things on both the App Store and iTunes Store, but it also allows you to tap into the powers of iCloud. At first blush, iCloud lets you sync over things like photos, notes, contacts, movies, music, podcast and apps. However, it can also sync over pairing information with Bluetooth devices that use Apple's proprietary W1 wireless chip, like AirPods. When you sync your AirPods to your iPhone, iCloud automatically takes that information and shoots it to all your other Apple devices. Your Mac, your Apple Watch and your iPad all know you have a pair of AirPods and instantly store the required pairing information. To actually pair the AirPods to these devices, you have to do some manual work. With Apple Watch, you can just leave your iPhone at home, take your AirPods and Apple Watch out and enjoy the music. The same goes for the iPad, with the added benefit of simply popping open the AirPods case when you're using your iPad. You can also just swipe open Control Center and click your AirPods from the music broadcast section. However, your Mac is where things require a little more effort. Macs don't support instant pairing, so you'll need to click on the Bluetooth drop down menu on your Mac, then select your AirPods and click 'connect'. How do you reset Apple AirPods? If you're having issues with your AirPods, it may be worth resetting them and starting from scratch. In order to do so, press the button on the back of the charging case while your AirPods are sat inside for around 10-15 seconds. You should see the status light flash amber a few times and then hold white. At this point, you'll have factory reset AirPods and they'll be ready to quickly link back up with your other Apple devices. Do Apple AirPods work with Android? Yes. You won't get the cool, instant pairing that Apple devices get with AirPods, but you'll still be able to use them. All you have to do is pop open the case and press the little circle button on the back. From there, your AirPods will enter pairing mode. You'll then have to navigate to the Bluetooth settings menu of your device and chose your AirPods, pairing them as you would with any other pair of Bluetooth headphones. Not so magical. Do Apple AirPods fall out? This seems to be one of the primary fears of people before purchasing AirPods. And, well, it turns out to be mostly unfounded. At Wareable, we've used AirPods from the jump, and they haven't really fallen out of our ears during normal, everyday use. This may surprise folks who have used Apple's wired headphones, like the EarPods, but it turns out this is a simple physics problem. Wired headphones have a cable that's constantly tugging at something lodged in your ear; the constant pulling makes them more susceptible to coming out of your ears. AirPods lack a wire, and don't have that same force pulling them out of your ear. 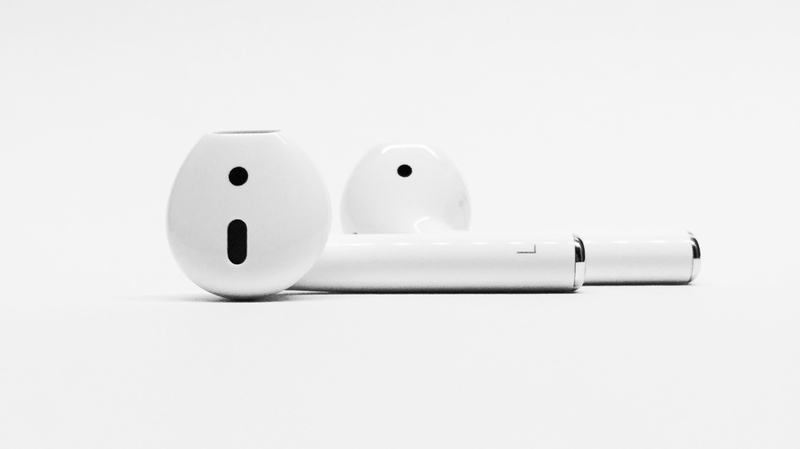 In fact, AirPods have a slightly longer stalk, so that they can balance against your ear a little better. If you're looking to use AirPods for your daily commute or casual gym sessions, you're not going to have much trouble. However, there are times when AirPods might not be ideal - see below. AirPods are great when you're stationary, or when you're dancing, or even when you're rushing through people and streets to make your train. However, they're not always the best for working out in. Why? Well, the AirPods aren't sweat-resistant. This brings not only potential moisture problems to the hardware, but sweat also makes the buds slightly slippy and prone to dislodge slightly if you do decide to exercise with them in. So, if you sweat near your ears a lot, you'll maybe want to avoid the AirPods for your run and go with something that handles sweat in a little better. For the most part, AirPods will keep a pretty solid connection to your phone - iPhone devices, especially. However, we've found that when we're outside and slip our phone into our back pocket, the connection is sometimes choppy. In fact, it's not a problem exclusive to AirPods. One of the weaknesses of Bluetooth is its connection quality when more exposed. When you're indoors, the Bluetooth signal has a lot of walls and ceilings it can use to bounce the signal from your headphones to phone, ensuring a steady connection. That goes away in the open air, so when your phone leaves direct contact with your headphones, like when it's interrupted by the material of a pocket or a purse, which sometimes have metal rivets or leather belts in the way, a problem arises. There isn't really a solution here, other than to wait until it subsides, stand closer to walls as you walk or to just hold your phone in your hand.